Not to be confused with Spruce Goose. 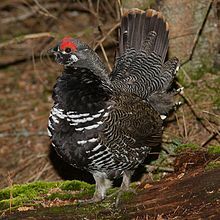 The spruce grouse or Canada grouse (Falcipennis canadensis) is a medium-sized grouse closely associated with the coniferousboreal forests or taiga of North America. It is one of the most arboreal grouse, fairly well adapted to perching and moving about in trees. When approached by a predator, it relies on camouflage and immobility to an amazing degree, for example letting people come to within a few feet before finally taking flight, a behavior that has earned it the nickname "fool's hen".